I've not commented...but I've been following along. It's a fascinating project. This is sooo neat to watch it come together!! Thanks for checking in, friends. This morning I wanted to do a tryout of one of the cams with the frame. 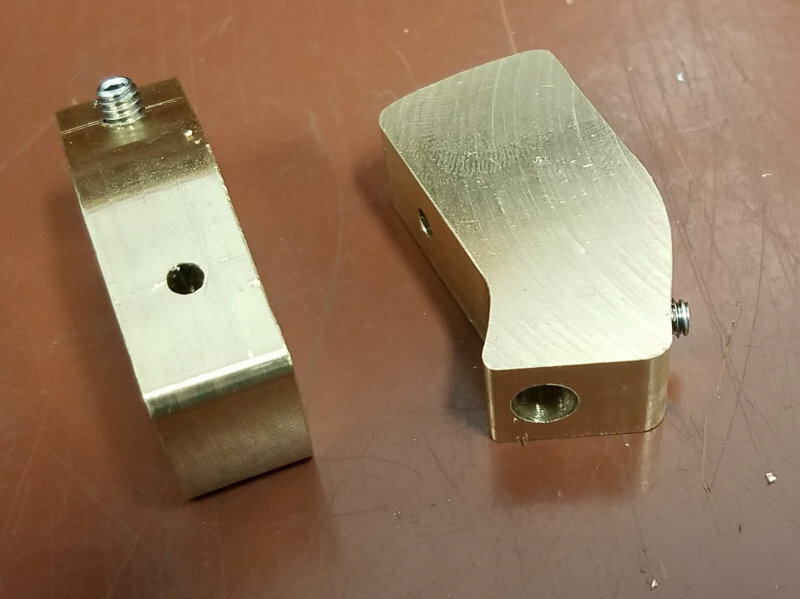 After cutting off a 2" axle of 1/8" drill rod, I made a sandwich on it consisting of the brass gear spacer, frame, eccentric, hypocycloid, cam assembly, and a retaining collar. I could not turn the sandwich. 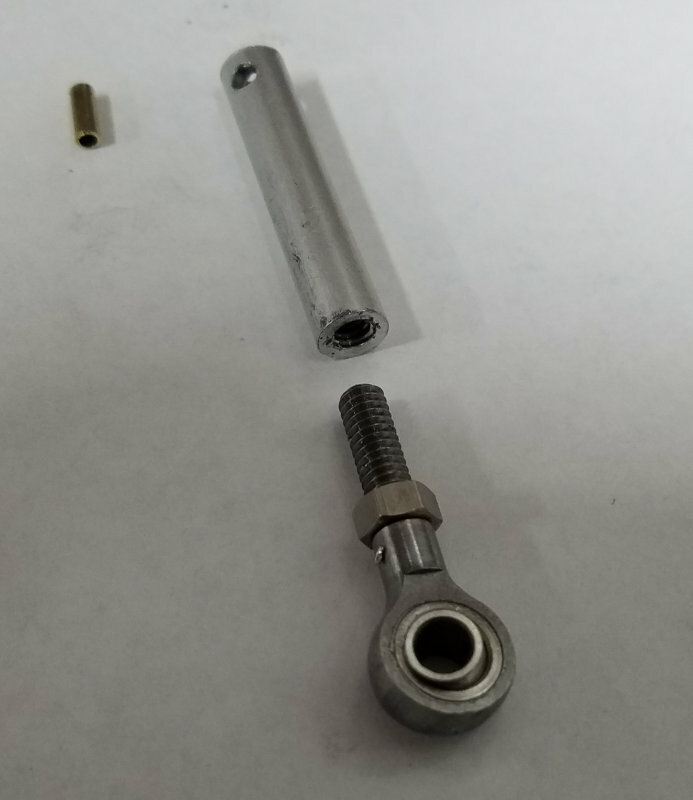 Since it turns relatively easily without the cam assembly, it was clear that the fit between the hypocycloid and the pins on the cam assembly were too tight. Following the instructions for a similar situation with wood, I wrapped some 180-grit sandpaper tape around a finger and lightly sanded the holes in the hypocycloid. After reassembly, I was able to turn the shaft, and it seemed to loosen up even more after a few rotation. I had a similar experience with the eccentrics in the hypocycloid loosening up with use. As long as the pins don't wear the plastic too much we should be good. Here's a short video of the motion. Very nice Kirk and whatever you did seems to have freed it up nicely!! Still watching with interest. That looks good. Yes I'm still following along. Each of the gear sandwiches need to be tested individually, so that can wait. 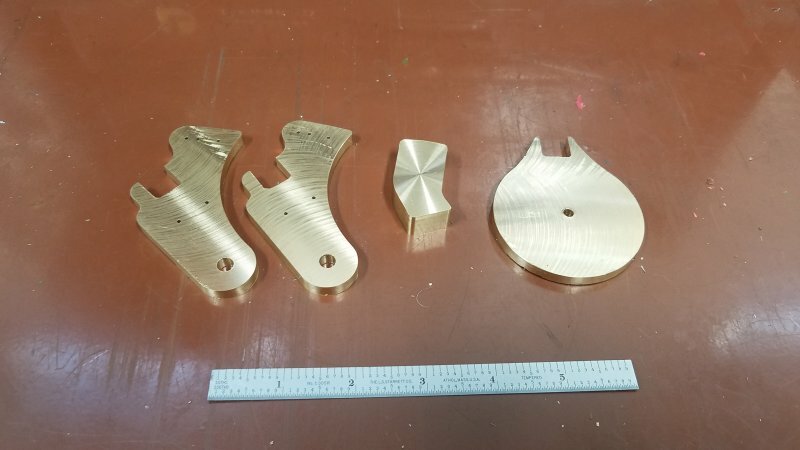 I decided to start on the remaining CNC parts. Here's the result at the end of the day. The two on the right are the main mounts between the frame and the rest of the "bird" parts. Since they pivot against the frame brass was required. 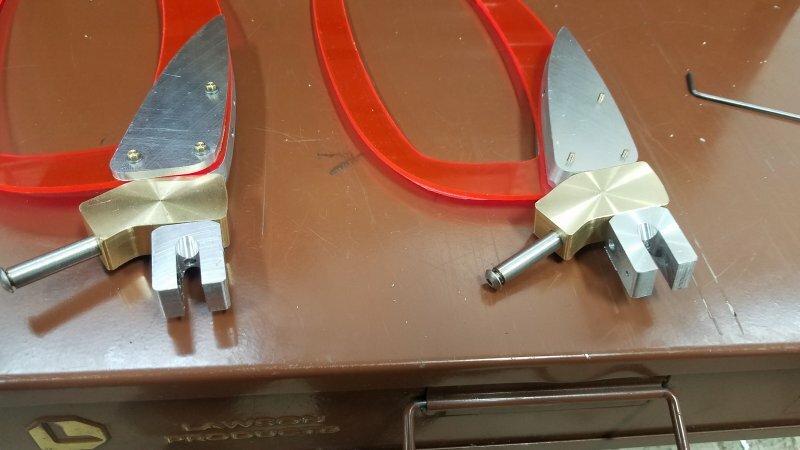 The center part (one of a pair, with the other one a job for tomorrow) is the connector between the wings, wing frame, and the pivoting linkage. Further drilling and tapping are required to finish them. The part on the right is the flange to which the counterweight will be attached at the end of the build. It's from brass mainly because it could be machined at the same time as the mounts. Here's the flange attached to its arm. 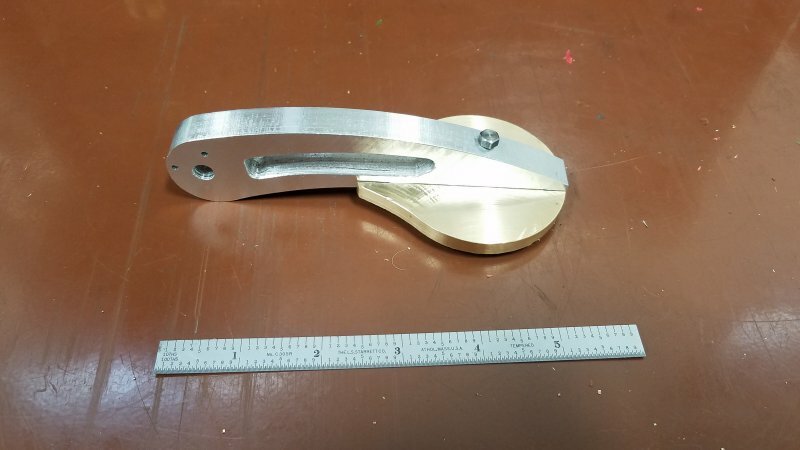 The shoulder pivot was machined from some 1-7/8" hex bar. After the profile is machined, I parted part way on the lathe, and then used the bandsaw to cut the rest of the way. Then a facemill on the Bridgeport to bring to size. Today was "work on wings" day. The first job was to mill the the other shoulder, and then to drill the three needed holes in each. Since there are no right angles on the profile, the machinists vise, surface plate, and square were needed for each. Vise stop made the drilling repeatable. The quarter inch hole accommodates a steel tube that will ride in needle bearings on the wing frame to provide rotation around the "Y-axis", as seen from the side. The eighth inch hole connects to the wing itself and yields rotation on the X-axis. Then the frame itself rotates on the Z axis. 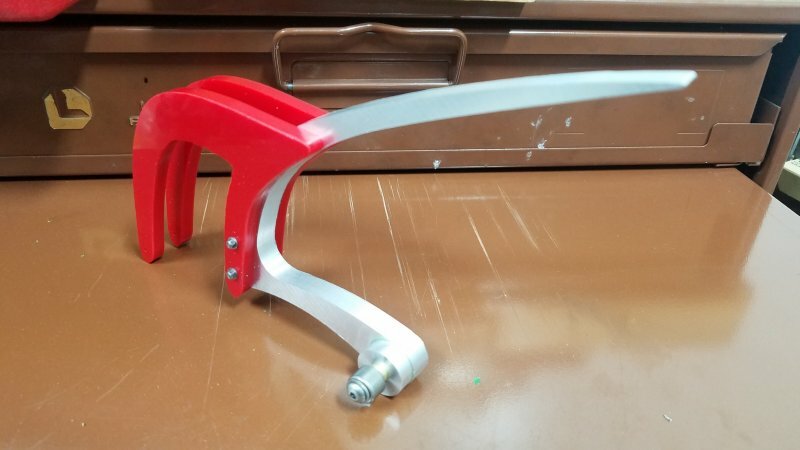 The next parts are a pair of aluminum tubes that connects the wing pivots to the heim joint. We need a 3/32" hole that will contain a brass bushing. The other end of the tube is tapped 8-32. Here again a vise stop makes drilling the second part fast. 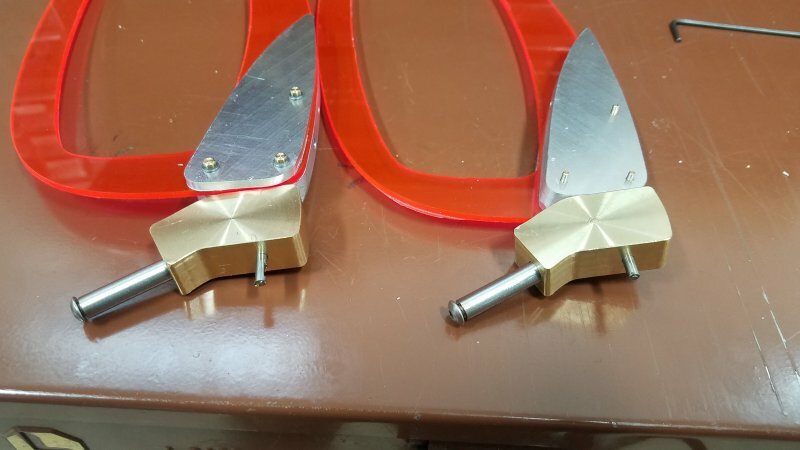 The two i/8" rods that connect the wings get flats for the grub screws. I was able to use the same vise setup as for the tubes to facilitate this. 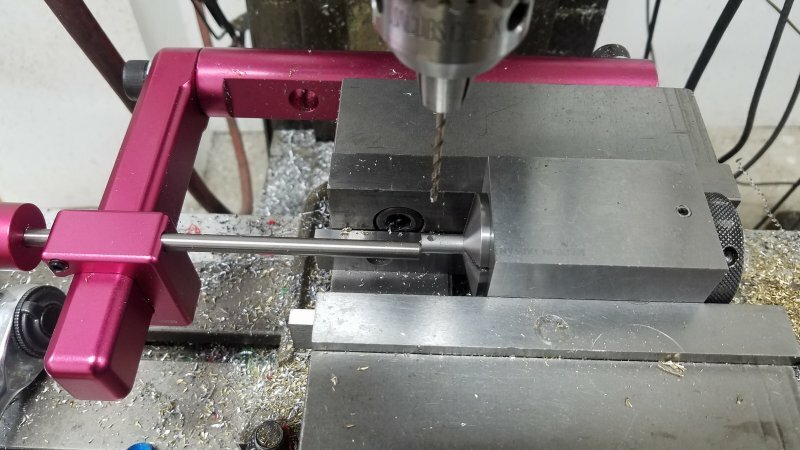 3/16" endmill .005" deep. The two flats on the left are for the wing, and the one on the right secures the pivot. I neglected to take a picture after the pivot tube was added, but it goes into the slot of the pivot and is secured by a 1/16" pin through the bushing in the tube. The end profiles of the wing's shoulder plates and the wing itself didn't match perfectly, so a bit of fettling is needed to allow the shoulder to pivot freely against the wing. Im watching your progress, all parts looks great! Will for sure come back to this once I start to build mime. If you decide to build in metal like this the major thing to be aware of is that all the parts attached with #2 screws from the plans need to have tapped holes in the part being attached to. 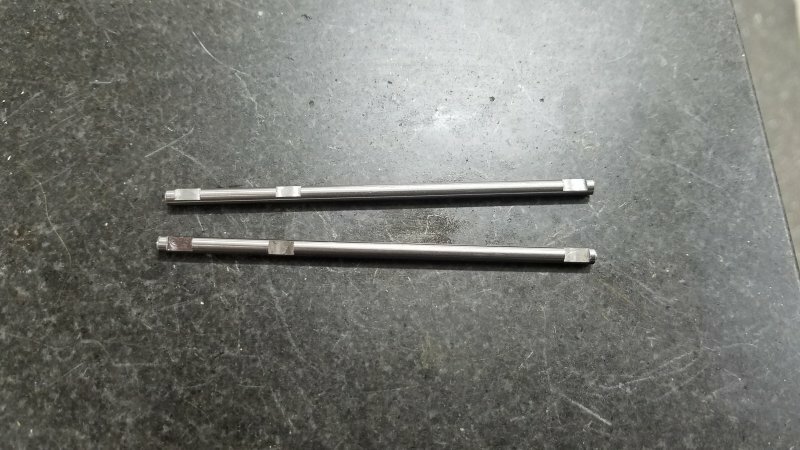 I've also found having oversize reamers for .126 and .251 and a .063 drill are a necessity. I've also attempted to avoid any places where one aluminum part moves against another. Today in the shop I started the day with assembling the head unit. I needed to through drill the holes in the acrylic as these were cut on the vacuum table. I just used a hand power drill for this. The other work needed here was to turn the 1/4" aluminum spacer and the 1/8" brass spacer and glue it all up with Loctite. I had made a mistake on the acrylic by making them both from the same DXF, but it turns out the screw holes on the two sides are offset to allow use of the 4 holes in the hummer bill. However, I was able to use the same two holes for both as my 2-56 screws went in less than halfway through. The rest of the afternoon involved attaching the brass gear spacers to their gears. In the wood version these spacers are glued, but I wanted a removable attachment. This, I needed to drill the gears for two 2-56 screws and tap the spacers to match. This involved some ugly setups, but eventually I got there. 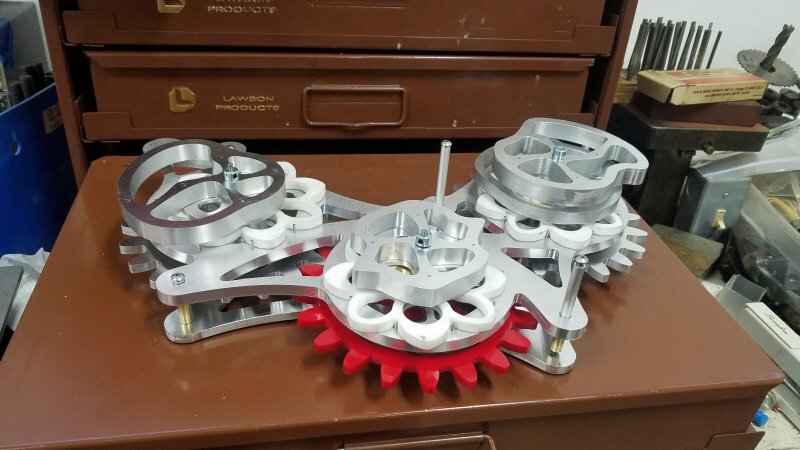 I did a trial attachment to the frame with the acrylic gear and one of the aluminum ones, and got a very satisfactory mesh of th gears, and they turn quite freely. Even pressing the gear spacer against the aluminum frame didn't cause appreciable friction. Coming along great. My shop elves keep asking when they can take a flight on the hummingbird! Update for the shop elves. 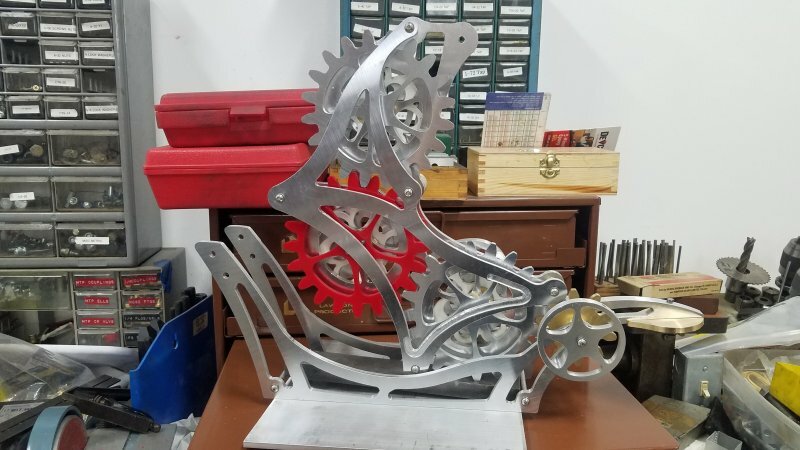 Spent the day working on getting gear train and cams moving on the frame. Much tedium in machining shafts and tubes plus fettling. 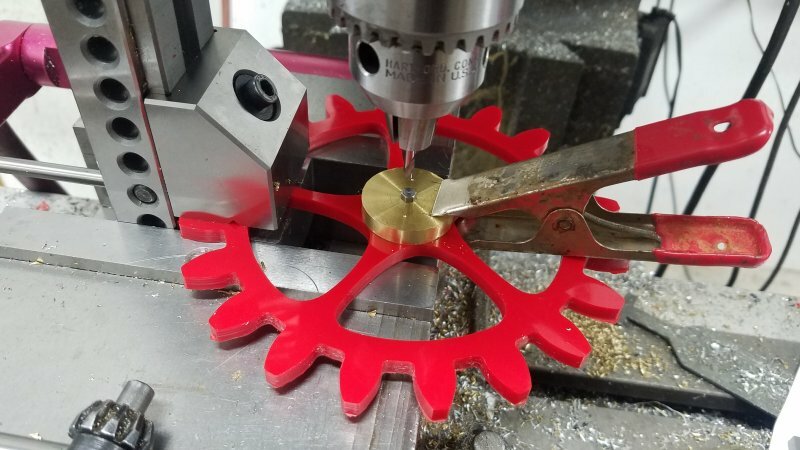 I needed to sand one of the hypocycloids, but now all three are moving when the gears are turned. 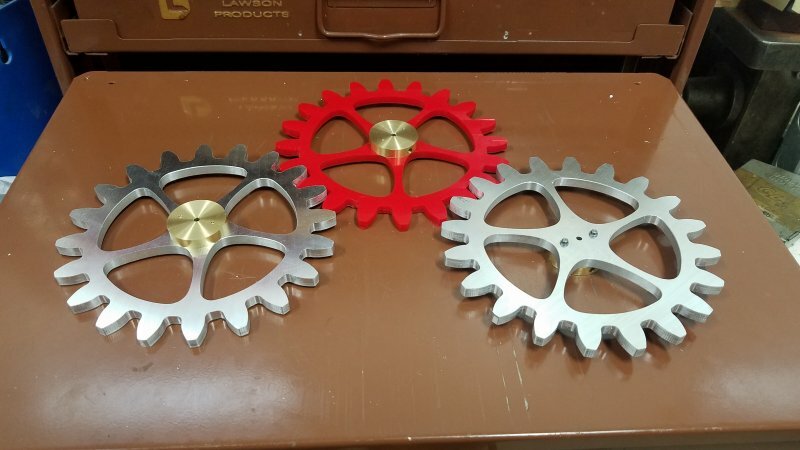 One is stiffer then the others, but I can still turn the entire mechanism with a finger on a gear tooth. I suspect it will loosen up with more running in. 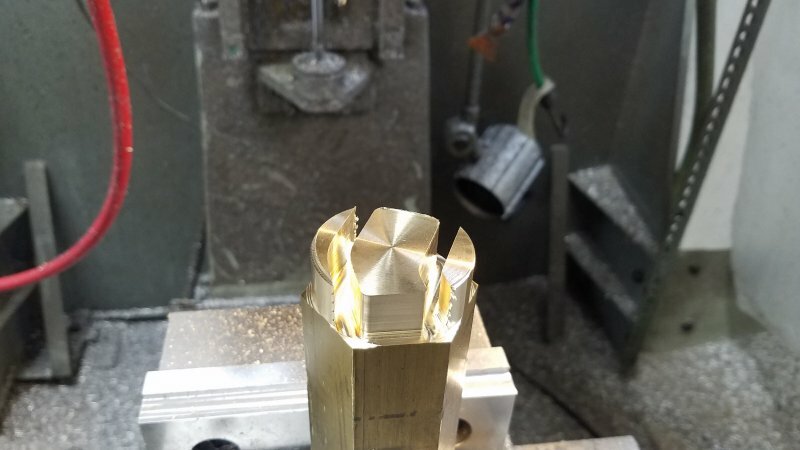 Next time I need to machine the spacers for the cam followers so I can see how they line up with the cams. Most impressive Kirk!! Shouldn't be long now. Happy things are going together well on it. With the mechanism mounted on the base, I was able to measure and make numerous spacers. I needed three for the cam followers and four for the input shaft. 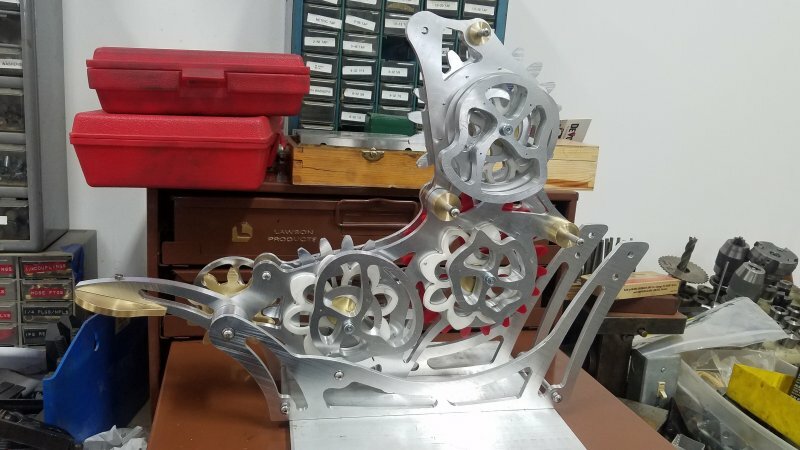 I still have a couple more to do there plus mill flats on the shaft for the crank and the small brass gear. Weight of colibri as she sits is ~ 12 pounds.